We rang in the new year with friends. The adults enjoyed fellowship and good food, while the children enjoyed time together, making funny videos, playing BINGO, and just being silly. It was a good start to the year. I've told myself in 2013 I'm actually going to USE many of the projects I've pinned to my Pinterest boards. In the late night hours I pin many things and have many grand intentions. In 2012 I didn't follow through on quite as many pins as I would have liked. When used in moderation, Pinterest can make us more creative, fun, and enhance our homeschool in limitless ways! This was EASY to make and very effective. I imagine you could use it for many things. One thing that pops into mind is setting the clock to the time of your child's birth and using this as a fun birthday cake! 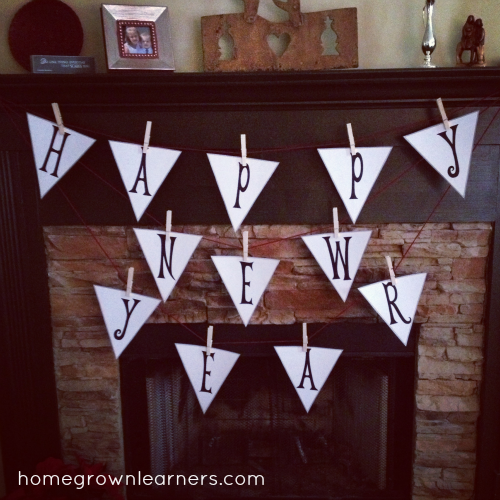 While this is on my fireplace now for New Year's, I noticed the site I pinned it from has printables for all holidays. I envision changing the banner for the seasons. Fun! We have made this one several times, and Anna requested it for New Year's Eve. It's not great for the waistline, but it's oh so yummy! My favorite Pinterest board is the LEGO Activities board -- it's full of crazy good ideas! Come visit with me on Pinterest. Let's resolve to actually DO WHAT WE PIN this year! Do you have a favorite projoect/recipe/activity from Pinterest?